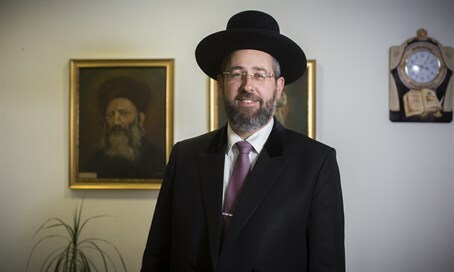 Ashkenazic Chief Rabbi of Israel, Rabbi David Lau, on Friday gave a special message to Arutz Sheva readers ahead of the Passover holiday that begins on Friday night. Rabbi Lau hailed the Passover seder as "the night of the birth of the nation of Israel," and referenced a midrash (exegesis) of the Jewish sages saying Ya'akov (Jacob) prayed on the night of Passover because it is a special time of connection for the soul with the nation of Israel and with God. The Chief Rabbi of Israel spoke about the first Passover night during the plagues before the exodus occurred, noting the similarities to the seder today. He imagined a father telling his children that night, "remember how Ya'akov came down to Egypt, and we came here and at the beginning it was okay, and then a new king arose and the difficulties started." "And the father shows the bruise of the whip on his shoulder, he could show them where it hit him," said Rabbi Lau. Continuing the father's imagined narrative, he said, "but then Moshe and Aharon came with great tidings that first of all we will merit to leave here, that we will receive the Torah from God, that we will reach the Holy Land, we will return to the land of our fathers, and we will merit offspring who are our continuation." This tradition continued the next seder with an addition of the other plagues that had since befallen the Egyptians, he said, and a year later additions from the miracle of the parting of the sea and the giving of the Torah were included. But he emphasized that the description of the seder and the miraculous story of redemption has remained the same. King Solomon, the son of King David, asked the same question of "mah nishtanah" (what is different - ed.) in Jerusalem around 3,000 years ago that is asked by children at the seder now, said Rabbi Lau. "Now we ask ourselves, what is different?," he posed, mentioning the Hamas bus bombing in Jerusalem on Monday in which 15 victims were wounded, indicating that the nation of Israel still suffers. He noted how he visited the wounded at Hadassah Ein Kerem Hospital, where three seriously wounded victims are still under a medically-induced coma and on respirators. Rabbi Lau pointed to the uncertainty Jews face with the danger of bus bombings and terror attacks looming. "So on the face of things, what's different? We see that in every generation 'they stand before us to destroy us,' but we have to remember that we have a complete faith which tonight we will again instill within us: 'And the Holy One Blessed be He saves us from their hands,'" he said, referencing the seder liturgy. Rabbi Lau recalled God's promise to the patriarchs that while their offspring would suffer in Egypt, they would go out with great possessions, both physical wealth from the Egyptians and spiritual wealth from the giving of the Torah at Mount Sinai. "What's changed? We are blessed that in contrast to previous generations, we are able to be at this special seder night in our land, in our homes, in our national place." Addressing Jews around the world, he said, "we're here already, we're in the land, but we also ask from those who maybe can't but really want to come to the land, (and) we remind those who can and still don't want to: Come, the chair at the seder table is waiting for you." "This is the land where soon, we will merit to reach Jerusalem and stand in its walls to offer the Passover sacrifice, to see the Creator bless the entire community of Israel, all as one," said Rabbi Lau. Delineating the process of the exodus leading up to entering the land of Israel, he said, "currently we expect and await 'and He built for us the chosen house (i.e. the Holy Temple),' to see the nation of Israel in peace and joy here in the Holy Land." "Chag sameach to all viewers, listeners and fans of Arutz Sheva, chag sameach to all the house of Israel," concluded the rabbi. His message in Hebrew can be viewed below.